Travelling through Europe in a campervan or motorhome is one of the best ways to see these beautiful countries at your own pace. So if you’ve been reading my detailed campervan articles so far, you should now be well and truly prepared, and “in the know” to get yourself ready for your big trip. Many people have commented on the level of detail in these articles, and the amount of planning that goes into it. To be honest, we’ve done it so many times now, that it hardly seems like onerous planning. We intuitively do this stuff. If you are new to the world of campervan hire, however, the details and the pre-planning will be what could ultimately save you from a disaster. The last thing you need is an administrative issue threatening your plans. Once we have done all the upfront planning, it’s freedom from then on. From the moment we pick up the campervan, there are no real plans or rules. There are just places to go, experiences to be had, and plenty of food and beverages to be consumed. If we love a place, we’ll stay longer. If we don’t, then we simply move on. Taking time out to have a cuppa made in the campervan. I wanted to watch the boats go through the locks. To give you a sense of just how much European countryside we covered on our last trip, I’ve put together a map. I know it might seem like a lot of driving but it’s not onerous. As you can see from the detail below, we averaged about 100km a day. Remember, I’m an Australian and 100km for us is not considered much at all. This is probably why so many other Aussies love driving campervans! The distance you go depends completely on your personal plans. 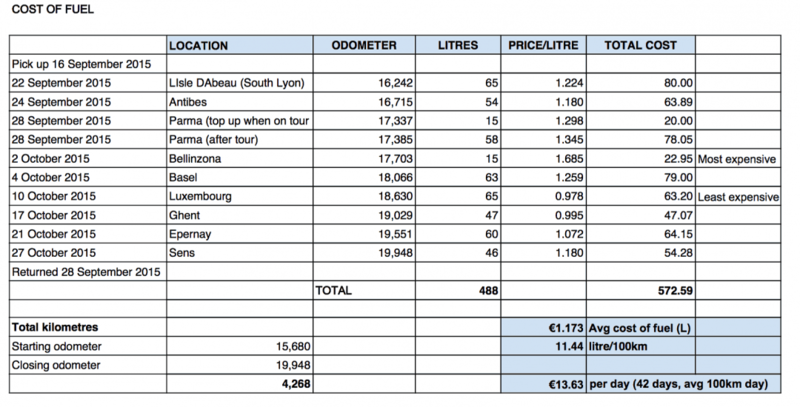 How much does it cost to drive a motorhome around Europe? 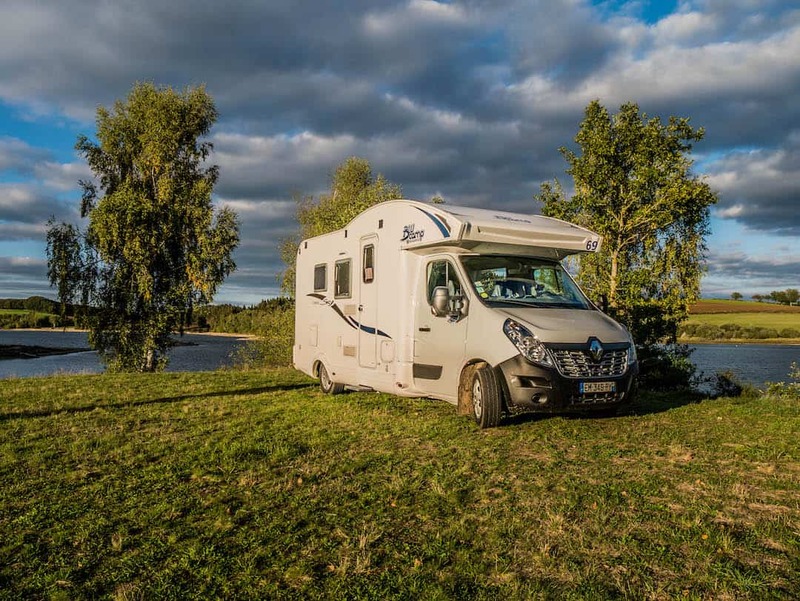 I get many questions about the cost of running campervans and motorhomes, particularly as it relates to fuel and camping costs. Of course, everything is relative, and everyone has a very personal opinion on what represents good value and what is expensive/inexpensive. Ultimately, it all comes down to personal circumstance. What I constantly remind myself of is that I can’t expect everything to be the same as it is at home, and that goes for cost. Things are going to cost more or less wherever I travel. Often my own currency is not strong against the Euro or the US dollar either. What I use as a comparison however is the cost of alternatives. So, in this case, the alternatives are the cost of hotels and other accommodation, car hire or other transport etc. I have mentioned before that a campervan is our accommodation, our transport and often our restaurant, so I am sure to benchmark accordingly. This trip, lasting 42 days, cost us on average, €133 per day. This is inclusive of our campervan hire, fuel and camp fees. I have not included food as this is highly variable, and we eat and drink very well when we are travelling. We are not budget travellers so I can honestly say that we have certainly paid this amount (and more) for a hotel room before, and then had to add everything else on top. For those that love the detail (and I know there are plenty of you), the following provides you with a snapshot of where we drove showing how easy it is to get to some really great places without having to drive all day. There’s no getting around this cost. If you hire a campervan and drive it, you will eventually need to refuel. But, surprisingly, it never feels as though this is a constant activity. Given the size of the vehicles, they are very efficient. These fuel costs are obviously based on 2015. The distances still remain the same. Just use a rough average of the current price to get an understanding of current prices. In the motorhome section on this website, there are other articles with more recent pricing. I would only use these as a guide however as prices are always subject to change. The type of camping spot dictates how much you pay. I will discuss the differences between these types of rest stops in coming articles, but for now, I’ve just simply noted indicative costs. We generally travel in the campervan during off-peak times, meaning we worry less about where we are going to spend the night and whether we need to book a campground. Note, there are always exceptions to this depending on the location/country you are in. We are passionate about travelling through Europe in a campervan. We’ve had so many wonderful experiences over the years that keeps us coming back for more. We always save money by travelling this way, but more importantly for us, it offers us enormous freedom to do whatever we choose. I know it’s not for everyone, but if I could convince those who have been thinking about it to give it a go, my job would be done! Looking to do a road trip? Here’s some more detail on how to get yourself ready for your big trip. Please note: Beer and Croissants provides accurate information at the time of writing but makes no representations or provides any warranty or coverage of liability for bookings made with France Motorhome Hire or any other hiring company. In the spirit of full disclosure, any bookings made through Beer and Croissants with France Motorhome Hire will generate a small commission, but will not cost you any more. In fact, by working with this company, we hope to bring you special offers from time to time. We do, however, always pay the full hire of any of our FMH hires ourselves. What a cool way to see Europe! My grandmother actually did something similar when she was in her 70s! Hired a campervan with her son and travelled around Europe! how cool was she!!! Love it. That is definitely a different way to see Europe and have your hotel traveling with you, sounds like a fun way to experience different areas. Oh, wow, this looks like an epic road trip! I love driving, but I feel a campervan would be a bit hard for me to handle (too big). Would still love to try it at some point in the future. You’ve been to some amazing places. Also, I see things have hardly changed over the past 5-6 years and Luxembourg is still in the lead with the cheapest gas 😀 I have friends in Germany who’d rather drive 40 kilometers to Luxembourg to refuel there than buy the gas locally. I can understand that about the Germans. We noticed too that most of the fuel stations were on the borders of Luxembourg, which said to us that this is exactly what the other country people did – drive to Luxembourg for cheaper fuel. Very detailed and informative. Breaking down the costs certainly helps for anyone wanting to travel with a specific budget in mind. Thanks! Wow, what a comprehensive post, and such an epic trip (even if you are an Aussie and eat 100s kms for breakfast!). We’d love to try campervaning next year and Europe seems a great place to start, thanks for the tips! Thanks Heather, love the analogy…..100km gets us nowhere here so we do get used to it. Hope you get to try it out some day. I like your posts about campervanning ! Especially as they are really specific. If we will set up for this kind of trip we will definitely ask you for an advice! And 42 days is a big number 🙂 Hope you Guys enjoyed every single day of it! Thank you so much, I really appreciate that. If you, or anyone you know ever needs help, please don’t hesitate to ask. Very comprehensive. I’ll pass this on to my brother who lives in Scotland and has just bought his own campervan with a view to travelling..
I’d love to do this! What a fab adventure! Wow, this is so much more affordable than moving from hotel to hotel and eating at restaurants. Thanks for sharing the costs with us. I’d love to drive all around Europe. There is so much to see and do there. I’d never get bored. Thanks Anda, that’s why I decided to publish this as I know people don’t always have visibility on costs. Great post. 🙂 lots of interesting facts on here as well. Never done europe in a campervan and for that long as well. Amazing trip! Thanks Danik.It certainly was great. What a great detailed and informative breakdown of your trip! We RV in the US and want to do it in Europe in the future and this is a perfect post to help us understand how it would work in Europe. Perfect thanks Bryanna. If you’ve done it before you are mostly there. Hopefully just a few Euro specific things to watch out for. We love camping and caravanning so I’m loving the detail in this posts. To be honest I hadn’t considered doing it around Europe before, mostly because I have all those narrow lanes in my head but of course that isn’t everywhere. One thing that surprise me is the quantity of free camping you managed to achieve, almost half your trip which is a great cost saver. Yes and if you didn’t need electricity or wifi, we would have stayed in even more of them 🙂 thanks Toni ! What I love about this article is the details. I love how you give a breakdown of the fees. It is another alternative and I guess the choice is up to you. I definitely think I could give using a campervan a try as it has its benefits. This looks amazing! It would be such a dream to travel Europe with a camper van. You covered so much countries in such a good time! Wonderful! Wow this is great I am so envious of you! Great breakdown of your costs too! Bookmarked! Oh wow– this is awesome! You guys got to see so much! I thought the costs would be higher. It ends up being pretty reasonable. yeah we think it is ! It’s my dream to become a grey nomad and retire with a camper van. I can’t wait. Really useful info thank you! Wow! This is really insightful. I guess I thought taking a campervan would make the budget more manageable, but this is actually quite pricy! I never thought to take a camper van through Europe! It must give you so much freedom to go wherever you please since you’re taking your bed with you. It was super helpful to see the chart of what you spent and how you spent it! I believe it’s one of the best ways to travel Gina. Wow. That is a great way to travel. Full of adventure on the road and i love that. I wish to do that as well even once in a lifetime. That sounds an epic trip. Europe’s countryside is so lush and beautiful. Camping where the mind wants to seems like a great experience. This is incredibly helpful and so detailed. I would love to do this someday — not sure I’d be able to do 43 days quite yet at around $150 US but maybe once I get my business going more 🙂 You’re right about hotels quickly adding up! Looks like a really unique experience. Thanks for sharing! Those excel sheets are everything! Seriously, you need to package this up and present this to a tour agency. They will love the transparency and the tried-and-tested nature of this program. These are travel goals right here! Maybe one day instead of a wedding i’d get a wedding-honeymoon 2-in-1 campervanning around Europe and getting married off in a rando church 😛 Thanks for the inspiration! yes this type of travel is for at least a month I think ! 100km isn’t too much. I drive that much everyday to/from work but I’d rather do this for sure! But for a campervan it must be difficult. What’s the top speed on that? I mean how fast do you guys go? Yeah 100km for us is nothing at all. We can quite easily do 1200km a day without it bothering us but I know not everyone is like us. We can still match it with the best of them on an autobahn, although we tend to sit at the 110km. They are big rigs and don’t pull up fast. That would have been a little squeezy. Thanks Adonis. This is such an adventure! I love the freedom of it. I’ve never traveled like this but I was jealous of the people in Iceland that were doing the trip in a camper van. They had so much more freedom than us!